Taken from GEO ExPro Volume 15, Issue 3. Focusing on large multi-client geophysical surveys and virtual data rooms. may want to allow certain items to be downloaded but restrict the download of others. may not want to show all data in a concession but still indicate that data exists. may want to allow interpretation of subsurface data – or only allow a view of current interpretation. may want to subset existing subsurface data, perhaps by resampling seismic. may want a global audience of O&G new venture professionals to know of the opportunity or may prefer to run on an invitation-only basis. will want a method of tracking any mistreated confidential data (e.g. watermarking with IP address of viewer). will want prevention of any robotic auto-download. will want all of this to be easily (EZ) set-up without a major effort (file reformatting etc.) on your part. Fortunately, the Zebra Data Sciences EzDataRoom® services have been designed to address these issues leaving just one, albeit tricky, task for you – to decide what to include within your VDR. The survey ship Polar Marquis will undertake surveys in West Africa later this year. Photo credit: Shearwater. Geophysical acquisition specialist Shearwater has recently been awarded several significant contracts. 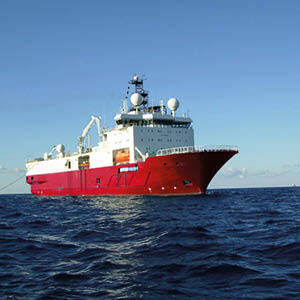 Three of the company’s vessels were engaged in surveys in the Indian Ocean for the northern winter season. For the second consecutive year it has been awarded a contract by TGS to undertake a seismic survey on the Atlantic Margin in the Norwegian Sea, covering 5,135 km2, which will be undertaken by one of Shearwater’s high-end 3D vessels, using FlexiSource and a wide tow spread, for which all Shearwater vessels are designed. In May Shearwater was also awarded two 3D seismic acquisition contracts for clients in West Africa, one of which is for Genel Energy in the Sidi Moussa licene offshore Morocco, which will cover over 3,500 km2. The other is for two surveys for an undisclosed client in West Africa, which are expected to take five months to complete and to cover approximately 10,000 km2 between them. Shearwater believes that these contracts are evidence that the seismic market is finally strengthening and improving. By acquiring Geokinetics Inc.’s entire US multiclient data library, FairfieldNodal has nearly tripled its North American multiclient library coverage, going from 3,532 square miles (9,148 km2) in the Permian Basin to 10,460 square miles (27,092 km2) in key US basins, including Appalachian and Powder River Basins. FairfieldNodal is an industry leader in seismic nodal technology and related services, specialising in revolutionary, true cable-free systems, both land and marine, as well as offering expert marine acquisition and data processing services. This transaction is part of the company’s aggressive plans to expand its multiclient data library, data-processing services and capabilities, reservoir analytics, and integrated solutions through partnerships and M&A.